Purpose: The purpose of this study is to evaluate the feasibility of percutaneous transauricular artery access for hepatic artery catheterization using a peripherally inserted central catheter (PICC) device and hepatic artery catheterization through auricular approach. Methods: Ten New Zealand White rabbits were used to establish a VX2 liver tumor model. Hepatic artery angiography and embolization were performed 3 weeks after inoculation. The rabbits were restrained in supine position under anesthesia. Intra-arterial access was accomplished with percutaneous Seldinger technique through the auricular artery using a PICC device. The hepatic artery catheterization was performed with a microcatheter and guide wire. The rate of technical success and procedure time was investigated. Results: Two rabbits failed initial percutaneous transauricular arterial access, with success in a contralateral attempt. Thus, percutaneous transauricular arterial access was achieved in 10 of 12 auricular arteries, with a technical success rate of 83.3%. The time needed to obtain intra-auricular access was 7.2 ± 3.1 min. Hepatic artery catheterization, angiography, and embolization were accomplished through the auricular approach in all 10 rabbits. Conclusion: Arterial access in rabbits can be achieved through the auricular artery. Hepatic artery catheterization, angiography, and embolization can be performed through auricular arterial access. The rabbit VX2 tumor model is often used in interventional radiology. The high growth rate, hypervascularity, and larger vessels are useful for the study of hepatocelluar carcinoma. Intra-arterial access in rabbits usually requires femoral artery cut down. Karnabatidis et al. and Chang et al. reported that transauricular arterial access could be an alternative to transfemoral access, but this innovative method has not been widely used.,, The lack of a suitable device is the primary cause of the unpopularity of this innovative method. The A peripherally inserted central catheter (PICC) device (Microintroducer Kit, MicroEZ™, Bard), with a 21-G needle, 0.018” guidewire, micro sheath, and dilator, enables less traumatic vascular entry, has been normally used in the clinic. The Peel-Apart sheath (4-F × 5 cm) is suitable for the central auricular artery in the rabbit. Using the Microintroducer Kit, transauricular arterial access was performed in rabbits with modified Seldinger technique. Hepatic artery angiography and embolization can be easily performed through this access. We report our experience using this novel technology. Animal care procedures and experimental protocols were approved by our institutional animal care and use committee. Adult New Zealand white rabbits, weighing 4–4.5 kg, were used in this study, and 3% pentobarbital was used for general anesthesia through ear vein at a dose of 30 mg/kg. Rabbit VX2 carcinoma preparation was performed as previously described., The technical details have been reported elsewhere. Rabbits were immobilized in supine position, and both auricular dorsa were shaved and scrubbed with a combination of povidone-iodine and an alcohol-based solution. The central auricular artery was the target vessel for endovascular access. The proposed method includes three basic steps. First, the desired artery was punctured with a 22-G microintroducer needle at the junction of the distal and middle third of the auricular artery [Figure 1]a. A finger was placed over the orifice of the needle to minimize blood loss. Second, the flexible end of the guidewire was inserted into the introducer needle and the auricular artery. The guidewire was carefully advanced into the external jugular artery. The introducer needle was withdrawn, leaving the guidewire in place. Third, a small incision was performed adjacent to the guidewire. The 4-F sheath and dilator were advanced as a unit over the guidewire, using a slight rotational motion. The dilator and guidewire were withdrawn, leaving the small sheath in place [Figure 1]b. The microcatheter was advanced into the sheath for hepatic artery catheterization. The time required for this was recorded and defined as the procedure time for transauricular access. A 3-F microcatheter system (Progreat, Terumo) was inserted into the external carotid artery from the auricular sheath. If necessary, the contrast agent was infused to obtain roadmap images [Figure 1]c. Subsequently, the microcatheter was advanced into the descending aorta under fluoroscopic guidance. Angiography was performed using 2-ml manual injections of contrast medium (Omnipaque-350; GE Healthcare) to optimize the celiac artery. The catheter was selectively advanced into the proper hepatic or left hepatic artery [Figure 1]d. After contrast injection through the catheter, angiography images confirmed catheter placement in the artery feeding the tumor, and chemoembolization was performed under fluoroscopy. After completion of the interventions, the sheaths were removed, and hemostasis was achieved with clothespin compression for 5 min. In two cases, puncture of the central auricular artery resulted in severe vasospasm with subsequent inability to insert the guidewire. In these cases, artery access was gained through the contralateral central auricular artery. Consequently, percutaneous transauricular arterial access was achieved in 10 of 12 auricular arteries, with technical success rate of 83.3%. Total procedure time for obtaining transauricular access was 7.2 ± 3.1 min (range, 5–15 min). After transauricular access was achieved, hepatic artery catheterization, angiography, and embolization were performed, with technical success rates of 100% (10 of 10). Recovery in all rabbits was without any local or systemic complications. No signs of hematoma, local infection, or neck swelling were observed. The hepatic VX2 tumor model in rabbits is important for interventional oncology research and is frequently used to study embolization or chemoembolization in hepatocelluar carcinoma. Traditionally, access in rabbits is achieved by surgical resection of the femoral artery, which may be finally ligated, rendering it vulnerable to iatrogenic trauma or even thrombosis. The method is time-consuming, requires an experienced operator, and sometimes fails. In 2006, Karnabatidis et al. described transauricular endovascular access using a conventional vascular sheath in rabbits. In 2011, Chang et al. described a novel arterial access using puncture of the central auricular artery with an 18-G Angiocath needle, which can be used directly as a vascular sheath. However, this innovative method has not been used often, due to the lack of a suitable device. PICC access is extensively used in clinical applications. A PICC device (Microintroducer Kit, MicroEZ™) has been designed for efficient and less traumatic vascular entry. The peel-apart sheath (4-F × 5 cm) is particularly well suited for auricular arterial puncture and access because of its relatively small length and diameter. Using the Microintroducer Kit, we successfully performed percutaneous auricular arterial access in rabbits with modified Seldinger technique. In this study, the technical success rate for auricular artery access was 83.3% (10/12). Hepatic artery catheterization was achieved easily, indicating that transauricular artery access with the Microintroducer Kit was feasible for use in rabbits. The mean time for auricular artery access was 7.2 ± 3.1 min, similar to that in the literature., The time required for auricular artery access with this innovative technique is shortened because it obviates surgical resection of the femoral artery. The central auricular artery is the major vascular supply to the rabbit ear, and runs through the central region of the ear, following a straight course along the dorsal surface. These anatomic characters make it an ideal site for access. The central auricular artery is a main branch of the external carotid artery. The angle between the aorta and celiac artery is acute in the transauricular approach, compared with that in the transfemoral approach. Hence, selection and subsequent advance into the hepatic artery might be difficult with the transauricular approach. Through “reshaping” technique, hepatic artery catheterization could be achieved using a microcatheter and guidewire. In the present study, hepatic artery angiography and embolization were completed in all cases with the microcatheter system. A limitation of this novel technique is its lack of suitability for use with interventional devices larger than 5-F, such as a balloon catheter or stent. The largest sheath inserted in the rabbit auricular artery was 4-F, and could only accommodate a 4-F catheter or microcatheter. Transauricular arterial access is feasible for hepatic artery catheterization. The advantages of this novel technique include reduced procedure time by the omission of shaving and surgical resection. 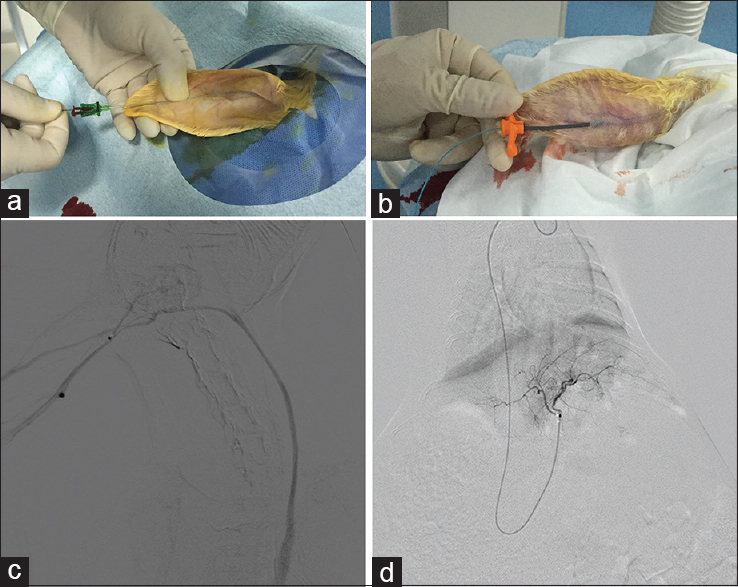 Transauricular arterial access can be used in studies that require angiography or embolization of the hepatic artery in a rabbit model. This study was supported by a grant from the National Natural Science Foundation of China (No. 81501563) and Jiangsu Provincial Medical Youth Talent (QNRC2016711) and Suzhou Science and Technology Plan (SYS201611 and KJXW2016005). Parvinian A, Casadaban LC, Gaba RC. Development, growth, propagation, and angiographic utilization of the rabbit VX2 model of liver cancer: A pictorial primer and “how to” guide. Diagn Interv Radiol 2014;20:335-40. Karnabatidis D, Katsanos K, Diamantopoulos A, Kagadis GC, Siablis D. Transauricular arterial or venous access for cardiovascular experimental protocols in animals. J Vasc Interv Radiol 2006;17:1803-11. Chang IS, Lee MW, Kim YI, Choi SH, Kim HC, Choi YW, et al. Comparison between transauricular and transfemoral arterial access for hepatic artery angiography in a rabbit model. J Vasc Interv Radiol 2011;22:1181-7. Park HS, Han JK, Lee JM, Kim YI, Woo S, Yoon JH, et al. Dynamic contrast-enhanced MRI using a macromolecular MR contrast agent (P792): Evaluation of antivascular drug effect in a rabbit VX2 liver tumor model. Korean J Radiol 2015;16:1029-37. Lee YJ, Kim YH, Lee KH, Park JH, Lee HS, Jung SC, et al. Sentinel node mapping of VX2 carcinoma in rabbit thigh with CT lymphography using ethiodized oil. Korean J Radiol 2014;15:29-36. Seong NJ, Yoon CJ, Kang SG, Chung JW, Kim HC, Park JH, et al. Effects of arsenic trioxide on radiofrequency ablation of VX2 liver tumor: Intraarterial versus intravenous administration. Korean J Radiol 2012;13:195-201. Li Z, Ni CF, Zhou J, Shen XC, Yin Y, Du P, et al. Expression of epidermal growth factor-like domain 7 is increased by transcatheter arterial embolization of liver tumors. Asian Pac J Cancer Prev 2015;16:1191-6. Yang C, Wang YL, Sun D, Zhu XL, Li Z, Ni CF, et al. Increased expression of epidermal growth factor-like domain-containing protein 7 is predictive of poor prognosis in patients with hepatocellular carcinoma. J Cancer Res Ther 2018;14:867-72. He K, Wan Y, Xian S. Risk analysis on infection caused by peripherally inserted central catheter for bone tumor patients. J Cancer Res Ther 2018;14:90-3. Bai XH, Zang S, Yu L. A comparison of two intravenous infusion devices in lung carcinoma patients receiving combined radiotherapy and chemotherapy. J Cancer Res Ther 2013;9:664-7. Ninomiya H. The vascular bed in the rabbit ear: Microangiography and scanning electron microscopy of vascular corrosion casts. Anat Histol Embryol 2000;29:301-5.